Got game? 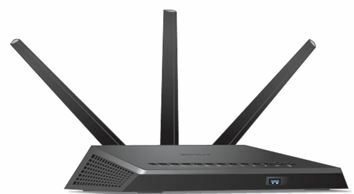 Well, this Netgear Nighthawk AC1900 WiFi Gigabit router is for you! Built with gaming, streaming and mobile devices in mind, this next generation gigabit WiFi router has a 1GHz dual core processor and delivers extreme speed so you enjoy less lag and less buffering. With Beamforming+ and built in high powered amplifiers and external antennas, get ready for the extreme! And now Nighthawk has you covered even when you're away from home with NETGEAR genie remote access and ReadyCLOUD you can manage your network and have access to a secure personal cloud anytime, anywhere. Stop buffering and start enjoying uninterrupted streaming media. With features like downstream QoS, Beamforming+ and built-in iTunes server you'll begin to stream like you mean it. Access your stored media quickly with USB 3.0 and keep it safe with free automatic backup software for PCs & Time Machine compatible for Macs. Improve your mobile WiFi speeds by up to 100% with Nighthawk! High-powered amplifiers & antennas help extend WiFi coverage throughout large homes & even backyards. For the first time Beamforming+ focuses WiFi signals to both 2.4 & 5GHz devices. With signals locked onto your device, experience what it really means to be mobile! Start enjoying your new Netgear Nighthawk AC1900 WiFi Gigabit router faster than ever. NETGEAR wants to make sure installation and management is simple & easy, so you can connect quickly & make sure you stay that way! Feel free to find out more about this wireless router here! I purchased this router about 2 weeks ago and I have to say I'm glad I spent the money on it. I was in the market for a router even though my 3yr old WNDR4500 router was working just fine, I felt as though I wasn't getting the right prioritization for gaming consoles vs tablets and virtually everything else, once I setup this bad boy I realized that was the case. First off even though my list is short I'll name them off. So being that I played my Xbox while my kids and wife are streaming videos and surfing the web I used to get some pretty bad lag to the point I banned YouTube "bandwidth hogs" during my Xbox playing time. I now am able to play my Xbox with little to no lag whilst my wife and kids use the Internet however they please. I should note that my internet connection speed is 15mb/s which is around the lowest tier offered by TWC in my area. I would highly recommend this product to anyone interested in a decently priced router is the best user interface settings and style. P.S. Stay clear of the app for netgears router it's about the only things I'd complain about. Horrible ugly and useless app . I've waited a long time to upgrade my router. My previous model was a Buffalo WZR-HP-AG300H flashed with DD-WRT that served me well since August of 2012. This model beats the pants off of the Buffalo in terms of range. I used to struggle with reliable reception in the outer edges of my ~850sf apartment, now I have no such difficulty. The R7000 is fast, reliable, and includes most features you'd want in a router. The only thing that's missing is an easy domain blocking feature. The one Netgear included is cumbersome in that you can only add a single domain at a time rather than a whole list (or at least more than one). The built-in DDNS is excellent, and the included mynetgear.com hostname is a nice perk. Range and speed are excellent. Configuration is pretty straightforward. Amazing router I can keep connected to WiFi while mowing my entire half an acre yard. My neighbors even connect better to my Wifi than to there own router. In the house I lose no speed from wired to wireless network. Highly recommended! Some times stop working.. need to reboot. Hope they can fix it in the next releases. Return to top of "NETGEAR Nighthawk AC1900 Dual Band WiFi Gigabit Router (R7000)"! !